Some of these early reporters at the Minnesota State Law Library show fire damage. For Minnesotans, March 1, 1881 is perhaps a “day that will live in infamy,” for it was on this date that the Minnesota Capitol burned to the ground. And although though the law librarian profession has no official hero or mascot, this date marks the true story of someone who might be deserving of such an honor. This disaster took place toward the very end of the legislative session, when both the House and Senate were in late evening sessions trying to get legislation wrapped up. This was likely why no one had noticed that the outside common areas had filled with flames. Someone hollered a fire alert to the Senate, but the House only got the message after a flaming ember fell down from the ceiling. Nearly 300 people managed to escape by a single narrow stairway, while others had to escape via windows with ladders and ropes. The entire story is dramatically captured in this old article from the Minneapolis Tribune, reprinted in the Star Tribune. Predictably, many books and irreplaceable records were lost in this fire. “The most serious loss…is the state library, which contained 12,580 volumes.” But a few lucky books did survive, due to the heroism of a one-armed janitor named Charles Chappel. He hauled loads of books out of the burning building in his single arm. When a falling beam hit him in the head he grabbed one last armful and finally left the building for good. Unfortunately, little information about Mr. Chappel survives today. With the help of ancestry.com, a federal census report from 1880 lists a 26-year-old Chas E. Chappel that was marked as “maimed, crippled, or otherwise disabled.” Another from 1920 lists a 76-year-old Charles E. Chappel living in St. Paul that worked as superintendant of the State Capitol. Though it’s very likely, it cannot be stated with absolute certainty that these records refer to our heroic book rescuer. 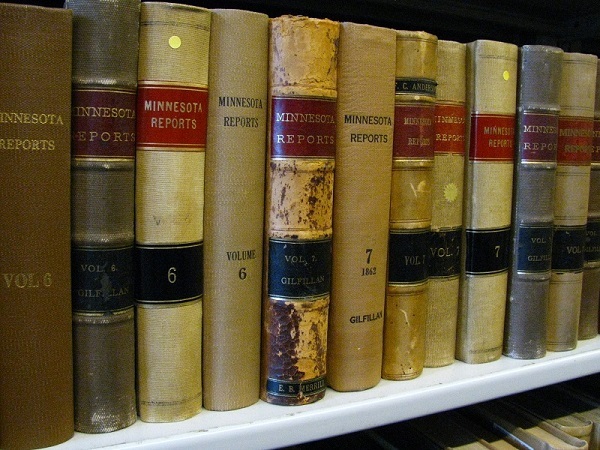 Nonetheless, today we can give a moment of appreciation for this unsung champion of what was probably Minnesota’s earliest government law library. Darrell Ehrlick, It Happened in Minnesota (Twodot, 2008). Ben Welter, Minnesota Mayhem: A History of Calamitous Events, Horrific Accidents, Dastardly Crime & Dreadful Behavior in the Land of Ten Thousand Lakes (The History Press, 2012).